Black Friday marks the start of the Christmas shopping period for many. Among the endless offers available to consumers is lurking the latest email scam in the form of a would-be offer from Apple. The email titled "iTunes Gift Certificate" purportedly claims that you've won a free voucher valued at $50 for iTunes, but in order to claim it you need to open an attached zip file, releasing the malware on your computer in the process. Reports by the BBC suggest passwords will be at risk, it will affect the performance of your computer, and may wipe files from your drives. The malware has been confirmed as Mal/BredoZp-B, first spotted by the German security group Eleven-Security. According to Sophos, a net security firm, the email suggests that once you have verified your account it will be credited with the $50 voucher. Consumers should be wary of any offer they receive through suspect emails that require you to act on them beyond visiting their respective websites. Apple does have some genuine offers on, though. Their one-day Apple shopping event offers a small discount on nearly all of their music and computer products. iPad 2s are available with a $41 saving, as well as a $101 discount on MacBook Air, Macbook Pro and iMac products. You can save yourself $21 on a iPod touch, but iPhone and Mac Pro products appear to have been excluded from the one-day special offer. Those hunting for a replacement Magic Mouse or most other Mac accessories can also take advantage of smaller discounts. 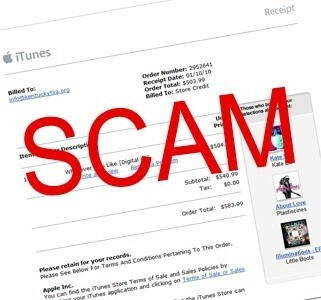 The Christmas period always marks an increase in phishing attacks and scams such as this iTunes fraud, as cybercriminals try to take advantage by preying on the shopping frenzy it creates. It certainly sounds appealing to cash-strapped shoppers when offered that sort of free money for music, videos or games. The USA Today has published a handy guide with tips and advice to better protect yourself during the festive season, which can help people avoid any unpleasant surprises in the run up to Christmas.